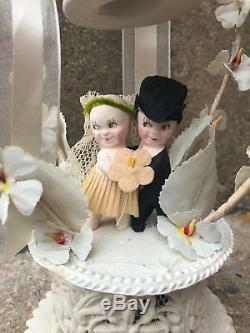 Vintage Kewpie Dolls or Rose O'Neil Wedding Cake Topper Antique. 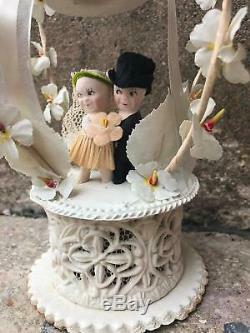 What you will receive: Vintage Wedding cake topper. 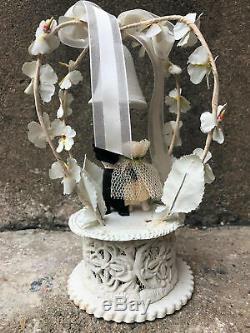 Material: Metal, lace, porcelain, ribbon and the base is made out of something thick that is paper based. Condition Report: Very good, pre-owned condition but appears unused! There is a crack in the paper or thick painted cardboard. A little white paint would cover it up if you thought it was necessary. I think it's all part of the charm. Because of the material, it's an easy cover-up. 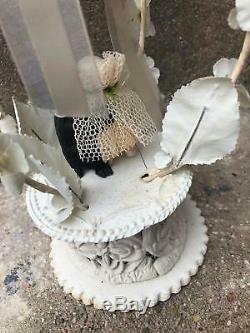 Length: about 9 inches tall. Width: across the bottom of the base, about 4 1/2. 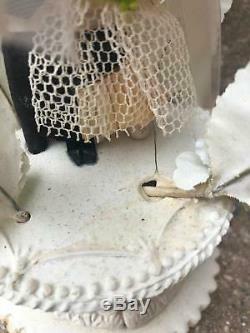 Each doll is about 2 1/2 inches tall. Special Notes: I'm not exactly sure on age. I've seen one and they called it 1920's. I think it's more 30's and 40's. Let's say it's 1940's or prior. Please view all pictures carefully as they're a significant part of the description. We want you to be happy and want to make sure you come back and shop with us again. Just send a message and we'll work it out and make everything right. From toys to jewelry and art. 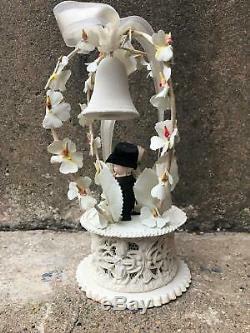 Most of the items we sell are vintage and estate found. Second hand or used unless they are new old stock. An item is never described as "mint" unless it's in it's original box and was never removed and or used. We do sell some selected new collectibles and they are new and are described as such. Please expect light to normal wear for items. We attempt to photograph and describe our items completely. If we call it a fixer upper or AS-IS it's because it's a wreck and has significant problems and those will be photographed and described. Please ask questions if you are a collector or more an expert in an area than we are. You may know what to look for that is critical to getting something in the condition you expect and we may not. Let us know and we will check and double check the item for you. If you have a problem with your order please talk to us first, we are human and do make mistakes but we want to make you happy so you'll shop with us again and again! Most of the items we sell are vintage. We spend time in all sorts of estates. If you are collector or are looking for something specific, let us know and we are happy to put you on our list and let you know if we come across it! 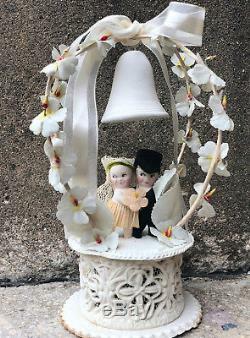 We have a solid inventory of clothing, vintage jewelry, toys, linens and so much more. Listing and template services provided by inkFrog. 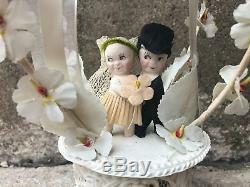 The item "Vintage Kewpie Dolls or Rose O'Neil Wedding Cake Topper Antique" is in sale since Wednesday, December 12, 2018. 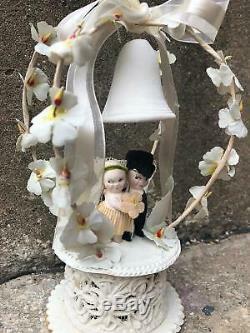 This item is in the category "Home & Garden\Wedding Supplies\Wedding Cake Toppers". The seller is "jims66supervan" and is located in Highwood, Illinois. This item can be shipped worldwide.